The NERF 2017 sponsored rebuild and trek programme is complete. This was the second year in a row we have run the expedition and the trustees couldn't be happier with how the trip went. For ten days at the end of November, ten adventurous and altruistic souls embarked on the trip of a lifetime - trekking further and higher into the Himalayan foothills than we have ever been before, and beginning work on a project of a much larger scale than last year. The aim of this year's project was to build a large water tank in Sothang village and also find a new water source from which to fill the tank. The villagers in Sothang used to have their own water supply, but this was closed up following the 2015 earthquake. The only other way the community could reach clean, potable water after the earthquake was to hike 2 hours to the bottom of a gorge. A few months before the trek, two of NERF's trustees carried out a recce along with local community leaders and found a brand new fresh water source high above the village in the mountainous foothills. From here, the charity funded the building of a new pipe to feed the water tank our trekkers would be building. Before the trekkers could get their hands dirty at the project site, we had a couple of nights acclimatisation and socialisation in Nepal's vibrant capital, Kathmandu. The first night was dedicated to team introductions, and gentle accustomisation of the senses to the exotic sights, sounds, smells and tastes in this at times overwhelming country. We had one full day in Kathmandu to fully overcome the jet lag and altitude change (the city sits 1400m above sea level). An expert guide took the group on a fascinating tour, taking in Swoyambunath Temple (or 'The Monkey Temple') and the ancient palace-filled Durbar Square, perhaps the most important site in Kathmandu - the cultural centre around which the rest of the town orbits. The next morning we left the hectic hustle and bustle of the capital and headed up to the Himalayan foothills. An environment diametrically opposed to the heaving streets of Kathmandu; vast green open spaces, interspersed with small smatterings of human settlement, clear blue skies, sweet refreshing clean air and awe-inspiring mountaintops peeking over the distant horizon in every direction. If Kathmandu can be a bit of an assault on the senses, the mountains can take almost as long to process due to the serene lack of noise and smog. Just clean, crisp nature supporting simple lives lived day-to-day. Our brilliant team of porters set up the first campsite at a slightly gasp-inducing 2400m, about 30 minutes walk from the project site at Sothang. Sothang is a village of approximately 500 inhabitants spread over 80 households. Nearly every home was completely destroyed in the devastating 2015 earthquake - during the intervening years very few have been rebuilt and most families still live in makeshift shelters. As described earlier in this blog, the earthquake also had long-lasting effects on the villagers' access to water - something we were on a mission to remedy. 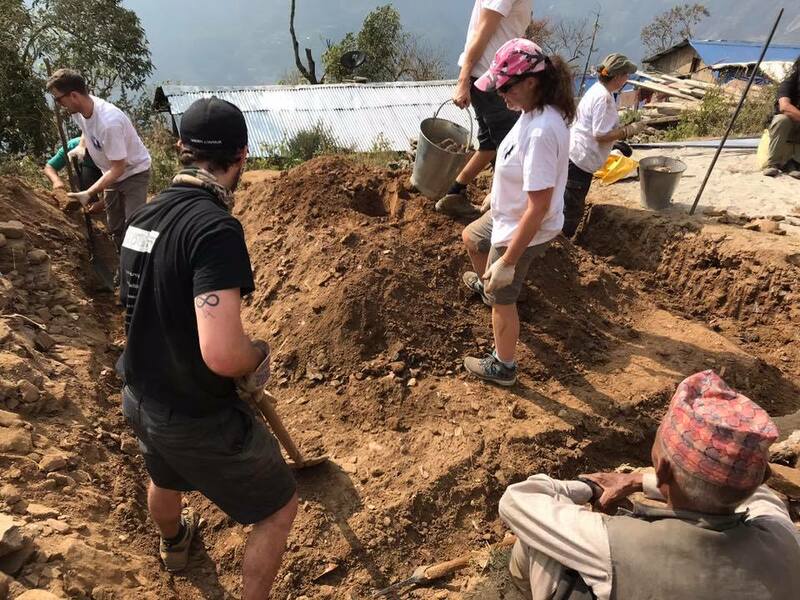 Over the next two days the trekking team worked in the village, collaborating with locals under the guidance of community leaders, to begin excavating and laying the foundations for the water tank structure. 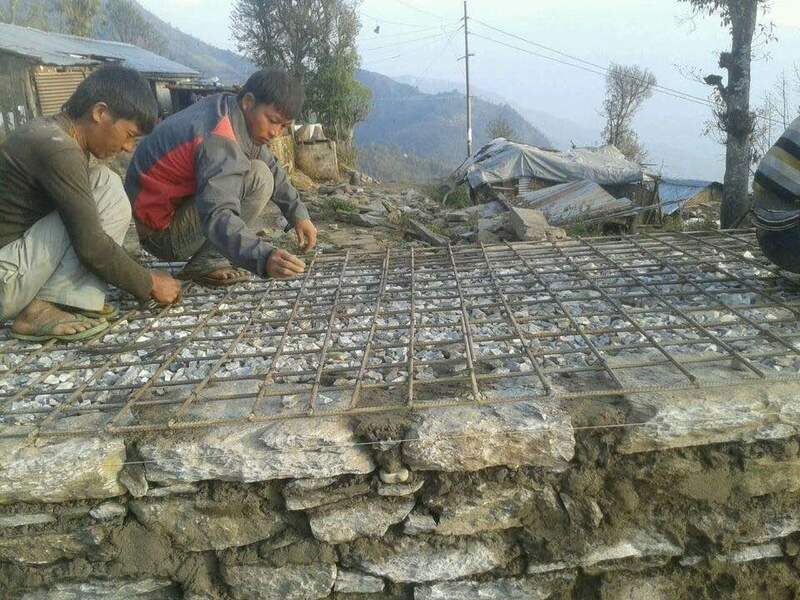 The sponsorship funds the trekkers had raised before the trip were used to purchase the vast quantities of raw materials needed to complete the project, and also to pay the wages of the skilled labourers who would carry out the more complicated construction tasks. NERF is under no illusions that our trekkers have the skills required to independently build a water tank, so we hire local people with the necessary skillset to carry out these tasks while the volunteers are on hand to do the equally necessary but less-skilled 'grunt work' (carrying heavy rocks and masonry, shovelling earth, sifting sand, mixing concrete, laying basic stonework). Our close connection to the community also allows us to be very responsive to their needs in terms of the projects we carry out. We can simply ask what projects they really want us to deliver; what will be of most benefit and genuinely improve their everyday lives. We can act quickly on this information and bring the project to life - such agility is a luxury that most of the larger International charities and NGOs simply don't have. 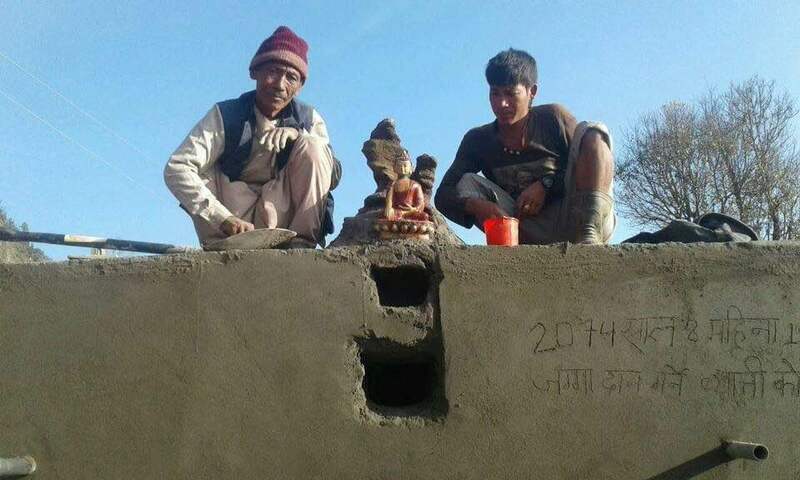 The construction wasn't fully complete by the time the trekking team had to move on, but in the weeks that followed the paid labourers completed the project. The tank is now fully built, insulated and connected to the fresh water supply we located a few months previously. What NERF, our volunteers and the local community have achieved together on this project is really quite remarkable - it will provide accessible, clean drinking water to many generations living in this village. It is truly life-changing for those that will benefit from it's use and we couldn't be happier with the result, or more thankful to the trekkers who took part and everyone who donated to them. Clink the image below to see a short video clip of the completed water tank. As the 'Rebuild & Trek' name suggests, the project-building element is only half of the trip. Once the trekkers had downed tools, the hiking could begin in earnest. Over the course of the next four days, the team climbed higher and higher up into the Himalayan range. We were walking much further than ever before and it wasn't long before we reached an altitude above all the main human settlements. Up here, it really is blissfully serene. Barely a sound bar the odd jangling cattle bell or the gentle rustle of wind through the treetops. Unbeatable views from ancient cliffside walkways. Jagged snowcapped mountaintops framing everything below: Vast hillsides pockmarked by landslides of old, a scattering of tiny villages, shimmering terraces of golden millet crops, and a luxurious carpet of rich green pine trees down to the valleys below. The immediate surroundings changed shape and density as we climbed higher too: Starting in beautiful dense Rhododendron forests under thick tree cover, before the large flora reduced and shorter shrubs took over as the altitude increased. At our highest campsite (3300m) we occupied a spot where no one had ever set camp before. There's no tourist traps here, we're totally off the beaten track - our local guide and guru, Beebal, ensures we have a completely unique experience and are really breaking new ground in terms of tourism in Nepal. We camped, seemingly, on the edge of the world. Perched on a high plateau, metres from a perilous clifftop that gave way to reveal an astonishing panoramic view of the immense valley. The river, more than 2000m below, barely visible, blinking into the hazy distance, as it twisted a course across the landscape and dropped over the horizon. We watched the sun slowly set in the distance before an endless canopy of twinkling stars enveloped the campsite, vivid and clear enough to trace the shape of the Milky Way spiralling overhead. This seemed a fitting way to mark the high-point of the trip. From here, we took another route for the two day trek back down, spending one final night outdoors by the riverside - celebrations fuelled by 'punchy' local moonshine - before heading back on the bumpy road to civilisation, safe in the knowledge we'd left a positive change that will hopefully outlive us all somewhere in the remote reaches of the Himalayan foothills. We are currently working on the itinerary for the NERF Sponsored Rebuild & Trek programme for 2018. This will take place again in November and full details will follow soon – watch this space!